Tungsten carbide rings have mainly been designed and manufactured with men in mind, something which we were also guilty off in the early days. As tungsten rings started to become more popular, and used as an alternative material for wedding rings. We started to receive more requests for Women's tungsten rings so that the couple could have a matching set of tungsten wedding rings. We have listened and as a result to your requests have a range of 9 tungsten wedding rings for women available in finger sizes as small as UK size I all from stock. Our 5mm tungsten wedding rings are available in both men's and women's fingers sizes. 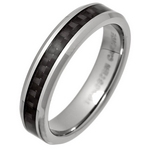 Our Tungsten Carbide Rings in Small Finger Sizes have been rated 10 out of 10 based upon more than 66 customer reviews.